I experimented with several things before deciding to use Faux Bone™ for the base of this brooch. My first experiments were with polymer clay but my metal clay element is quite big so I found the polymer clay I was using wasn’t strong enough. The Faux Bone gave me exactly what I wanted. This piece is 7cms tall and 6cms at its widest part. 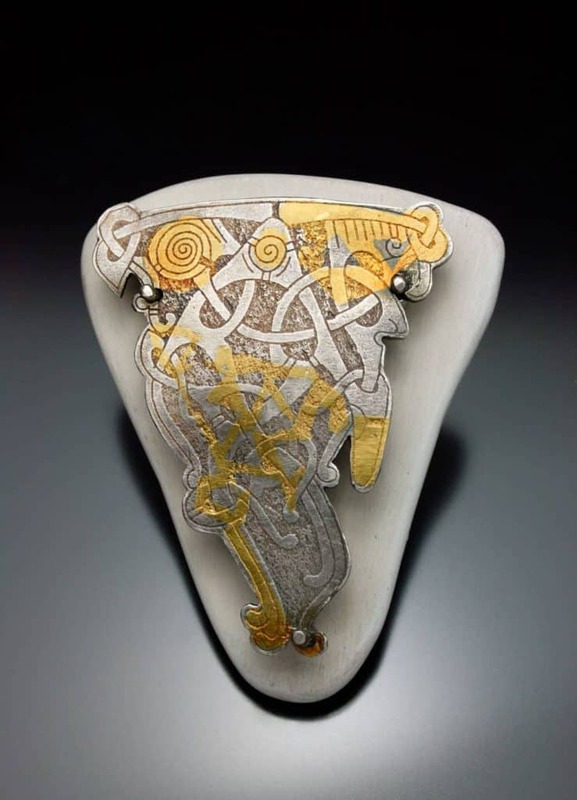 The texture on the metal clay part is a Celtic design which I made using the tear away technique. I textured the rolled out clay and then cut around the design. It was dried on wavy cardboard to give it some interest otherwise it would have been completely flat. Once it was dry I further refined the edges to get really close to the design. I like the overall shape of the metal clay element and the quirky pokey out bits! The Faux Bone was cut to shape and then sanded to remove the shine and add some texture to the surface. It was lightly coloured with acrylic paint which was then sanded off. This leaves a light colour in the rough surface of the material. This piece just scraped a pass. Here are the scores. ​The assessors remarks were all negative. “There is almost no relationship between the parts. The goal of stilt rivets is to add complexity, mystery etc through layers. This is totally lacking.” I agree with this. If I made the project again I’d give this much more consideration before starting. They go on to say, “Gold embellishment looks like an afterthought. Piece is too heavy for the pin. Plastic does not relate…adds clunkiness to what is otherwise a lyrical motif on the silver.” There were lots of things that are not right about this piece, but it still just scraped a pass. I really like stilt rivets so this is another project I’d like to revisit at some point. A brooch in which a metal clay panel is attached with stilt rivets to a base made of wood, plastic, or metal. A simple solution will be simply a layer of metal clay hovering over a panel of something else. A more sophisticated solution will incorporate several materials, with perhaps a back piece that includes findings.